Before You Consider Investing Your Money To Buy A Business, Shouldn't You First Learn How To Buy The Right One? 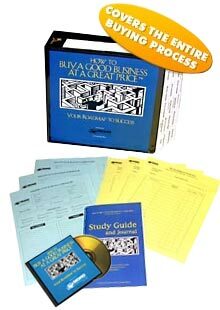 How To Buy A Good Business At A Great Price© is "the mostly widely used strategy guide and reference resource for business buyers." This is not a simple introductory guide on the subject. It is a comprehensive plan that breaks down each stage of the process and explains exactly what you must do at every step, and for every situation and critical decision you will face along the way. As a prospective business buyer, one of the most important tasks you face is to figure out with absolute certainty what type of business that is right for you. By following the proven steps that are laid out in the guide and our personal consulting support, you will know the precise formula to identify the right business for you, how to be sure it is a solid business with a great future, and the strategies to use to negotiate exceptional deal terms. We don't just send you a lot of information then leave you on your own to work through it. Once you begin to follow our proven program, you will be automatically enrolled in our Personalized Consulting Program. With this service you will have immediate and unlimited access to business buying specialists to help you with any questions, situations or challenges you encounter. No matter what questions you are facing, simply contact us, outline the situation and our experts will tell you exactly what to do. If you need some assistance or advice in reviewing a listing, formulating an offer, negotiating a certain part of the deal, investigating or valuing a particular business, reviewing the financials, or if you simply want an unbiased expert opinion about a particular situation where you're not positive what strategy to use, we will immediately provide you with our experienced input and recommendations. Whenever you need help, just contact us, outline the situation, and let us know if you prefer an email response or phone call. All inquiries are handled within 24 hours. There is no additional cost for this service and you can use it as often as you wish for as long as you need it. How To Determine The Right Business For You: Knowing what business is right for you is quite possibly the most important aspect of this process. When you match your greatest strengths to the right business you cannot help but be successful. This section includes a complete evaluation of your strengths, weaknesses, likes, dislikes, past successes, failures, previous experiences, interests, and a host of other components that will dictate the specific type of business that is right for you. Focusing Your Search: You'll learn where to look, the resources to use, and how to focus your search like a laser beam on businesses that make sense for you. Instead of wasting time searching endless business for sale listings trying to figure out which ones might be right, you'll refine this process to quickly identify prospects that fit your specific criteria. We'll show you how to get immediate replies from brokers and sellers so that you can devote your time to locating the right business instead of chasing people for information. Using Business Brokers: Most buyers don't realize that business brokers represent the seller and not the buyer. They're paid a commission by the seller and so their mandate is clear: get you to buy any business for sale, not necessarily the right one. Why use them at all? They serve two purposes: they can be helpful in providing you with access to businesses for sale and they're the ideal liaisons to deliver any bad news to the seller in order to preserve your relationship, especially if the seller will remain on-board after closing to train you. But it's important that you engage the right one. You'll learn how to check them out and get them to show you listings that are "reserved" for others. Reviewing Business For Sale Listings: There are 73 key issues to look for in every business for sale listing. Hidden things that can tell you a lot about a business, both good and bad. These listings will form the foundation of the many questions you'll need to ask the seller. You'll learn how to review them in great detail so you can immediately identify businesses that are worth pursuing and you'll completely avoid wasting time chasing ones that will never materialize. The Key Questions To Ask Every Seller: There are 36 critical questions that you must ask every seller. You'll learn what they are, when you should ask them, and, more importantly, the answers to look for. You will learn how to get the real "hidden" answers - not just what they want you to believe. You'll know the exact things you should and should not say to the seller, what to do, and the strategies to use to have the advantage in every situation and negotiation. Thinking About A Franchise? They're Not For Everyone: The right one can be a good entry into business ownership, but only for certain people. Don't buy a new franchise; it's only slightly better than a start-up. We'll show you how to buy a resale that's already successful. Valuing A Business: Worried about overpaying? Forget it! This program includes two proprietary and proven valuation formulas that will completely eliminate the guesswork and show you how to accurately value any business for sale. These simple-to-use models guarantee you will never overpay for your purchase. The True Valuation Calculation™ and The Diomo Business Assessment™ methods have been used successfully in thousands of business purchases. How To Flawlessly Investigate Any Business (This Is Crucial! ): Every business for sale has secrets that the seller does not want you to discover. You'll know how to uncover everything about any business before you buy! Your investigation must be flawless and it must begin the moment a business is of interest as there is so much to cover. You'll receive our 200-point Due Diligence Checklist & Strategy Guide© that is beyond compare and goes way past the financials to show you precisely how to investigate absolutely every part of the business: the competition, the suppliers, the customers, the contracts, the employees, legal issues, the industry, and on and on. Negotiating The Deal and Making An Offer: Our program will prepare you to effectively negotiate every part of the deal. There are over 50 specific clauses that must be attacked and this is what separates good deals from bad ones! We provide you with "what to do" checklists and point-counterpoint strategies for each component you'll have to include in a Purchase Agreement. We'll lay out the precise clauses you'll need to ensure you're completely protected from a future decline in the business or purchasing bad inventory or equipment or for any other liabilities that will surely come back to haunt you if you don't protect yourself properly. Hiring Professionals: We'll explain how to hire the right lawyer and accountant, and you'll discover eleven sure-fire ways to save a ton on their fees. After you receive your material, (either the hard copy, CD or download version) simply follow the techniques we've laid out, utilize our consulting service as often as you'd like, and if for any reason whatsoever, you feel that the information we have provided does not equip you with all of the knowledge and tools you'll need to buy the right business for sale, or if our program does not exceed your expectations in any way, just let us know at anytime and we'll immediately refund all of your money. This is not a 30, 60, or 90-day guarantee. We mean anytime. The reason we can offer this type of guarantee is simple: when you have a program that works, there's never any fear offering people the ability to get their money back if they're not completely satisfied. You can now get the complete course via electronic download and save $80.00 off the printed version price! You'll be on your way minutes from now! With the electronic version, you will receive a receipt for your purchase containing your link to retrieve your download immediately after you confirm your order. With the printed or CD version, we'll ship everything to you via UPS at our expense within 48 hours. The CD product will save you $50.00 off the print version cost. Immediately after you confirm your order, you'll receive simple instructions to download the complete electronic version of the program so you can get going minutes from now while your program is en route. Study Guide and Journal©: To track your progress, note key points to remember from each section, and log any questions you may have that you'd like to discuss with us. Prospective Business for Sale Portfolios©: A comprehensive four-part form to use when evaluating a particular business for sale. It will help you prepare your questions, detail your notes, organize the follow-up, and do an overall evaluation of any business you may be considering. Due Diligence Worksheets©: For the last stage of the business for sale buying process - investigating the company. This is not the time to let anything fall through the cracks! These worksheets will allow you to detail every task that needs to be completed, follow-up to be done, and general notes for this crucial stage of the buying process. A great companion tool for the 50-page section on Due Diligence. If you have any questions about or program, or about anything at all related to buying a business, please feel free to contact me at any time. It will be my pleasure to assist you.